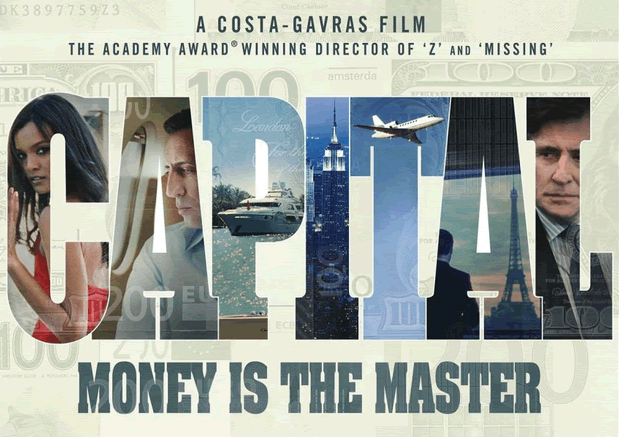 Cohen Media presents the latest financial thriller by the famous Oscar winning director, Costa-Gavras: Capital. Cohen Media presents the film “Capital“, written and directed by Costa-Gavras. Discover a fast-paced, thrilling drama with dark humor and breathless suspense, which depicts the high stakes of the world of global finance. Inspired by the book the “Capital” by Stéphane Osmont, the eponymous film was written by Costa-Gavras, Jean-Claude Grumberg and Karim Boukercha, directed by Costa-Gavras; with a cast that includes Gad Elmaleh, Gabriel Byrne, Natacha Regnier and Celine Sallette.